It's no secret that I love cookbooks. Reading, reviewing, and recreating recipes has become my second, albeit non-profit, career. But, for a while now, my husband has been encouraging me to close the cookbooks and create my own dishes, the way I do under normal circumstances when I'm not working towards a blog post. He's a staunch and utterly biased supporter of my cooking skills, fully convinced that I can run this blog based solely on my own culinary talents. While I do appreciate his support, I can't give up my cookbooks and quit sharing the treasures I find in there with you. Cookbooks are inspirational, helping to generate ideas for my own recipes. Yes, I duplicate some recipes exactly as written, especially when doing my reviews. But, most of the time, I'll take an ingredient or two from this recipe and blend with a few ingredients from another recipe, finding the perfect combination to suit our family's tastes. 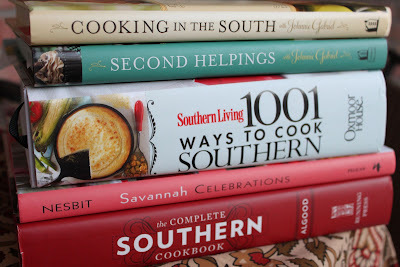 However, other than a few pound cake recipes that I'm dying to try and share with you (I'm officially declaring March to be Pound Cake Month), I'm taking my husband's unsolicited advice and am closing the cookbooks at least for a little while. My goal is to expand my repertoire and open my mind, hopefully generating something palatable and worthy of sharing.